A group of grad students is asked to study the scientific properties of an ancient relic held by the Catholic Church that is said to contain pure evil. What does pure evil look like? 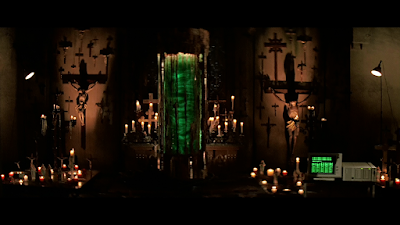 According to director John Carpenter, it looks like a green liquid contained in a glass and metal cylinder housed in a church basement in Los Angeles. "Prince of Darkness" is the second film in director John Carpenter's "Apocalypse Trilogy," a trio of movie that is themed on the end of all things and life as we know it, which also includes "The Thing" and "In the Mouth of Madness." The story revolves around Quantum Physics Professor Howard Birack (Victor Wong) and his team of grad students. 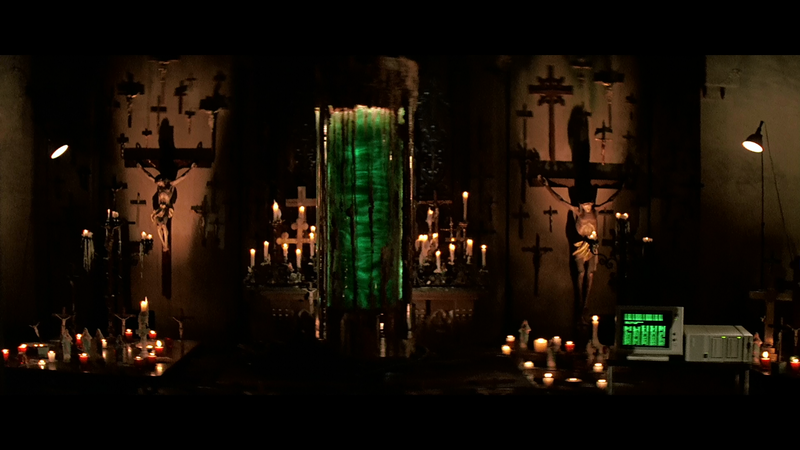 A priest (Donald Pleasence) has asked Professor Birack and his students to come to his church to study an old relic that may contain pure evil. The students agree to do so, but may not even realize the dangers they face. 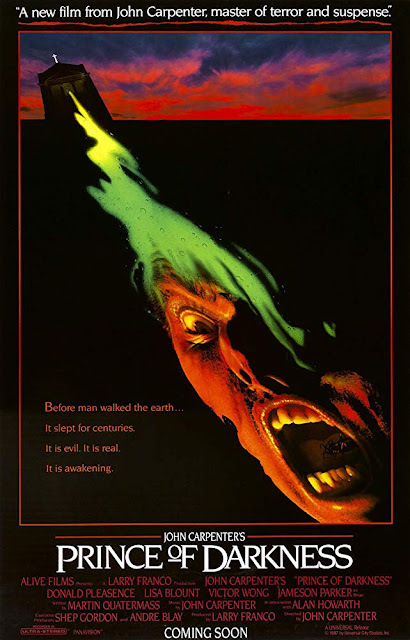 When people talk about John Carpenter's films, "Prince of Darkness" isn't one that comes up all that often. It's a little unfortunate because there is a lot to like about this flick. It doesn't have the best acting in the world (save for a masterful one by frequent collaborator Donald Pleasence), which might put people off from the start. Some of the performances are downright bad, but in true Carpenter fashion, he builds up the other areas of the film so well that we tend to forgive many of its other flaws. Where this movie excels is its visuals. Though some of them look dated, others are spectacular. There are also some excellent makeup and gore effects, which we think still look great today. People get squirted in the mouth one more than one occasion with a gross green liquid which, while disgusting, is also pretty fun to watch. This factor also adds a bit of comedy to lighten things up from time to time since we never know when someone is going to get gooed. The film boasts some tense moments, as well as a good, eerie atmosphere. On the flip side, there's a lot of talk about religious and scientific mumbo-jumbo so you might get lost (like peons like us) unless you majored in religion or chemistry. Finally, one of our favorite aspects of the film is Alice Cooper, who plays a possessed homeless person. He gets to stand around and look creepy, a look Cooper mastered years prior to filming this movie. What's not to like about that?! "Prince of Darkness" may not be John Carpenter's most remarkable film, but it may be his most underappreciated. As religion and science collide, the end result is a fun, weird, gross dramatic horror with a killer ending.